Matthew’s birth narrative is extremely short and yet, in its efficiency, it links us into the story of God’s people and introduces us to a pattern for what the life of the people of God will look like in this new age. Most Christians know the two highpoints of the church year are Christmas and Holy Week which form the bookends of the life, death and resurrection of Jesus. The ancient creeds of the church (the Apostles Creed and the Nicene Creed) spend almost all their words about Jesus focused on the birth, death and resurrection. Matthew simply tells us, “Now the birth of Jesus the Messiah took place in this way.” And then in seven short, but packed verses, takes us from the announcement of Jesus’ impending birth to the birth and naming of this child from the Holy Spirit. 23 If there is a young woman, a virgin already engaged to be married, and a man meets her in the town and lies with her, 24 you shall bring both of them to the gate of that town and stone them to death, the young woman because she did not cry for help in the town and the man because he violated his neighbor’s wife. So you shall purge the evil from your midst. 25 But if the man meets the engaged woman in the open country, and the man seizes her and lies with her, then only the man who lay with her shall die. 26 You shall do nothing to the young woman; the young woman has not committed an offense punishable by death, because this case is like that of someone who attacks and murders a neighbor. 27 Since he found her in the open country, the engaged woman may have cried for help, but there was no one to rescue her. The practice of stoning was probably no longer used for adultery in the time of Mary and Joseph, but Mary’s public humiliation by Joseph could place her in a vulnerable state and labeled as a sinner and an outcast from the community that she knew. Joseph is called a righteous man, and in the character of Joseph we are exposed for to what righteousness will look like for Matthew’s gospel. Instead of righteousness being a strict adherence to the letter of the law it will be a far more gracious understanding of righteousness. Joseph’s resolution to quietly end the engagement and not expose Mary to public shaming is viewed as a model for the righteousness of the kingdom of heaven. Joseph must resolve how he will interpret the commands of the law in his life and he becomes one who hungers and thirsts for righteousness and will be filled, who shows mercy and will have mercy shown to him as Jesus will later say in the Beatitudes. Joseph’s namesake in the Hebrew Scriptures is a dreamer and an interpreter of dreams, so it is fitting that Jesus’ father receives his revelations in dreams. 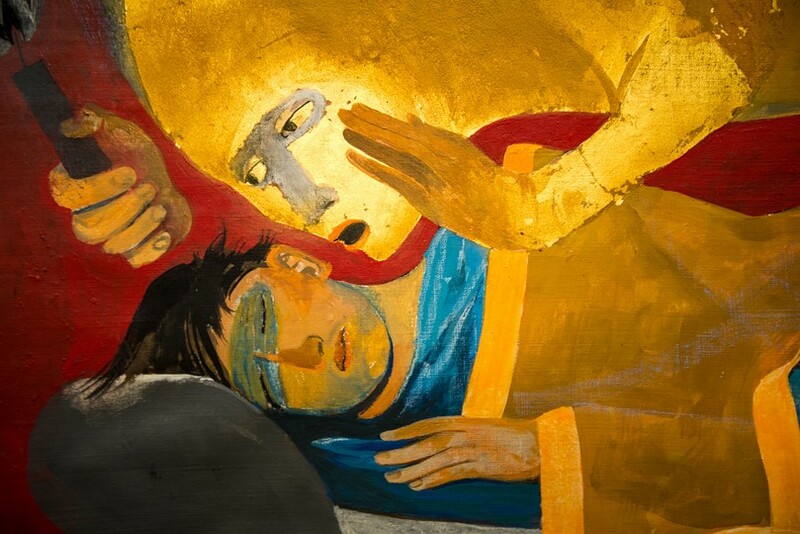 The angel of the Lord, the mouthpiece of God in much of the Hebrew Scriptures, appears to Joseph in his dreams and reveals the origin of Mary’s child and tells Joseph to take her as his wife. The only speaker in this narrative is the angel of the Lord, Joseph acts in obedience to the angel’s words in his dream but we never hear him utter a word in the gospel. Two additional times Joseph will receive guidance from the angel of God in a dream and all three times Joseph will obediently follow the instructions of the dreams. Joseph will take Mary as his wife, Mary will bear their son, Joseph will name him, and both the angel and scripture will speak about this child to be born. Just as the first Joshua would close the chapter of the people’s wandering in the wilderness after their liberation from Egypt and initiate their dwelling in the promised land, so Jesus closes the chapter of powerlessness and deprivation that occurred in the exile. Something new is happening in Jesus’ birth. Matthew quotes from the Septuagint, the Greek translation of the Hebrew Scriptures, where the Hebrew ‘almah is rendered parthenos in Greek. Unfortunately, any translation into another language locks in certain meanings and while ‘almah is a broader term that includes young women of marriageable age and one gloss of the meaning could be a virgin, in the Greek the term parthenos means virgin. This caused quite a stir in the history of bible translations and is one of the reasons there was a break between RSV (now NRSV) and NIV (and later TNIV) translations. When the RSV translated Isaiah 7:14 as ‘young woman’ many conservative Christian traditions demanded a translation that was harmonious and the NIV translation was formed to address this need. While Mark’s gospel throughout its narrative will allude to the mysterious way that in Jesus, somehow, we are experiencing the presence of God, Matthew will, from the very beginning of the gospel, emphasize that Jesus linkage to several title associated with God throughout the scriptures. The idea that Jesus is Emmanuel, God with us, forms a bookend of the gospel of Matthew. In this first chapter we hear Jesus given this title in a quotation from Isaiah and in the final chapter the resurrected Christ will remind his disciples that,” I am with you always, to the end of the age.” Somehow Jesus will embody God’s presence among the disciples and in taking the language of the scriptures and the presence of the angel of the Lord we are quickly introduced to who this child will be. Joseph never speaks, but he does obey. Joseph dreams and acts upon those dreams. He will embody a righteousness that is both obedient and merciful. Joseph takes Mary as his wife but waits to consummate the marriage until the birth of Jesus. Joseph gives Jesus the name he receives from the angel of the Lord in the dream, but unlike Luke we don’t hear any stories of shepherd and angels from the night of his birth, instead Matthew has set the scene with the announcement and scripture of who this child is and we end this chapter waiting to see how the world will receive him. This entry was posted in Biblical Reflections, Gospel of Matthew and tagged Birth of Jesus, Christmas, Emmanuel, Gospel of Matthew, Immanuel, Matthew 1, Saint Joseph, St. Joseph. Bookmark the permalink. Great reading. In Deutero-Isaiah God’s forgiveness of Israel and Israel’s physical return from exile are tightly bound (Isaiah 40:1-2, 9; 41:11, 25-27). The restoration of Israel after exile is the manifestation of God’s forgiveness. Is there reason to think Matthew has compared Jesus’ work to Israel’s exilic forgiveness and Joshua’s acquisition of Israel’s rest in the land only to excise the national/physical component of that redemption? In other words, was Herod mistaken to fear this new king of Israel, this new Joshua? Much more on Herod in chapter 2, but the language of the king of the Jews used in chapter 2 plays on his insecurity as a non-Jewish ruler of the Jewish people whose position is dependent on Roman approval. I don’t believe that Jesus saw himself as a militant Messianic figure like others who would arise shortly after his death to reclaim the nation of Israel from the Roman oppressor but that doesn’t mean that Herod the Great (or his son Herod Antipas) or Roman functionaries like Pilate wouldn’t have heard some of the things that Jesus said and others said about him in those terms. The language of Deutero-Isaiah and other prophets of the period around the Babylonian exile would give Matthew much of his language to talk about who Jesus was and what he was doing but that language is often recast into a new and more expansive hope not as tightly linked to the major symbols of Jewish identity prior to the exile: Land, Temple, Davidic King and Torah (or perhaps it would be better to say that Matthew reconfigures what all of these things are and what they will mean). I think as I move through Matthew the shape of this answer will become clearer. The fear that Jesus would upend rulers through military insurrection was in the end proven misguided. But I think the consequences of Jesus’ apocalyptic vision were basically the same: Herod’s rule, along with Pagan Rome’s, would be dismantled and replaced by the power of God. God’s will would be done on earth as it is in heaven. So I don’t think the “land” and the “kingdom” to be inherited by believers have been transformed into merely spiritual or heavenly realities. While the land of Israel has faded in importance, Christ’s rule is still over “the nations.” It is still an earthly transformation that is expected. Christians still anticipated security from enemies and a place to worship without fear (Luke 1:71-75). and so says more about the means by the God’s reign comes into being than about the nature of God’s reign. The reign of God on earth is a heavenly one in the sense that it is established solely by God’s power.